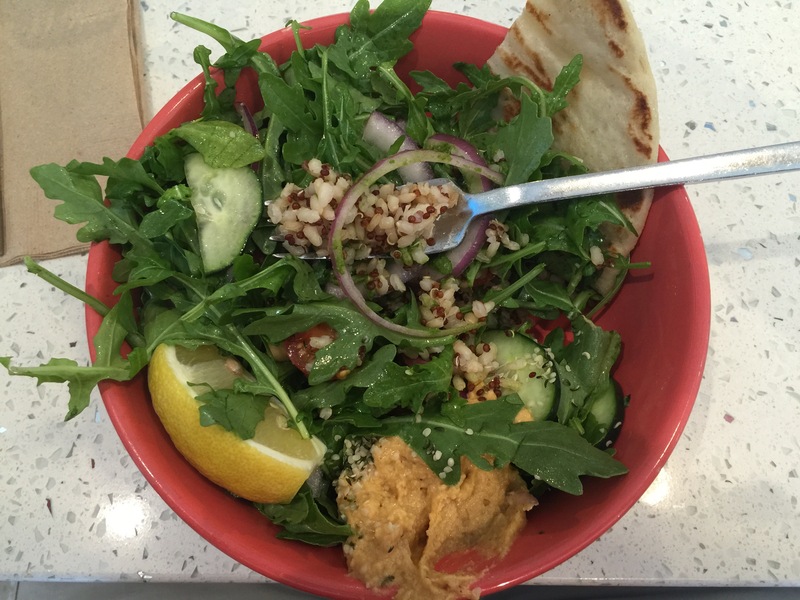 Culinary Fridays – Joi Cafe – Mighty Mediterranean Bowl | Jesse Hecht C.R.E.A.T.I.V.E. I walked into the Joi Cafe on a recommendation. The pure glass front shows a small but modern restaurant interior. A large class case filled with confectionery delights sat between a humble wood-encased iPad atop a marble bar and a juice refill bar with ice refills and a Brita water machine next to two large flat-screens depicting sports and news. On the other side of the room was another marble to-go bar and a number of packaged drinks and foods in a refrigerator. As of the time of this writing, I have one of these packaged foods waiting for dinner in my fridge, so we’ll see how it tastes in a later review. I was greeted by a friendly server at the desk and proceeded to order the Mighty Mediterranean Salad. Behind the server was a tastefully decorated blackboard with blue and white writing. It was a nice touch. The table I sat at was of a large block of white marble with reflective speckles that proved somewhat distracting with the glare from the lights overhead. As I sat, I could not help but notice the hum of machinery and fans, as well as a backing track of Caribbean music especially while trying to order. Truthfully, it’s a bit hard to hear in there, and the acoustics leave something to be desired. It took about 10 minutes to get to my table and I was pleased by the expedience in this busy restaurant. Garbanzo beans, heirloom tomatoes, Kalamata olives, cucumbers, red onions & arugula tossed with a kale hemp pesto over brown rice / quinoa mix. 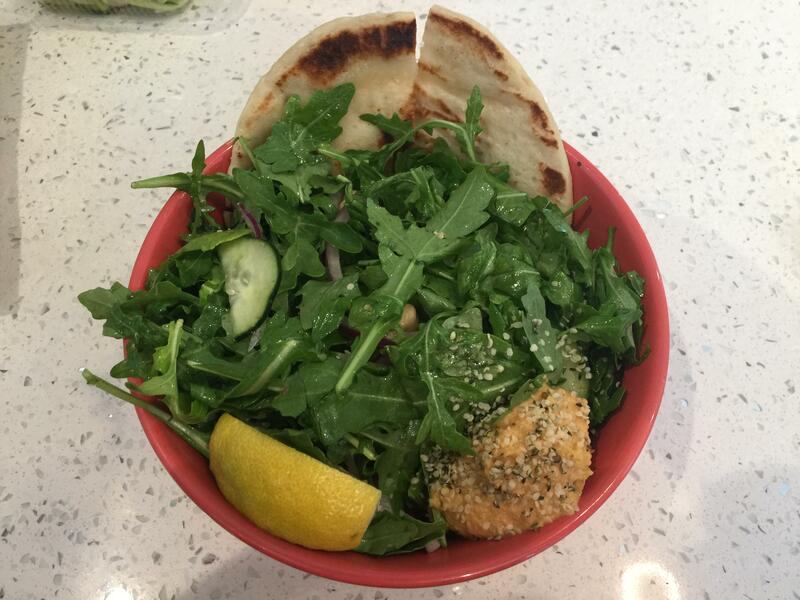 Served with toasted pita bread & hummus. The first bite I took was welcomed with a flavor of freshness. Of care. They really know what they’re doing here. The light lemon dressing gave the arugula a great perk beyond just what a heavier dressing could provide. I enjoyed the subtlety. Bite after delicious fresh bite with tomato, garbanzo, and sliced red onion filled my mouth with rich flavor. My only nitpick (after all, nothing is perfect) is that there could be more tomato and smaller sliced onion (they were almost noodles!). Overall the Joi Cafe was a delight to go to. The friendly staff, fresh food, and expedient service are a breath of fresh air, and while the place has some auditory and decor issues, this place is one not to pass up if you’re looking for a healthy meal.